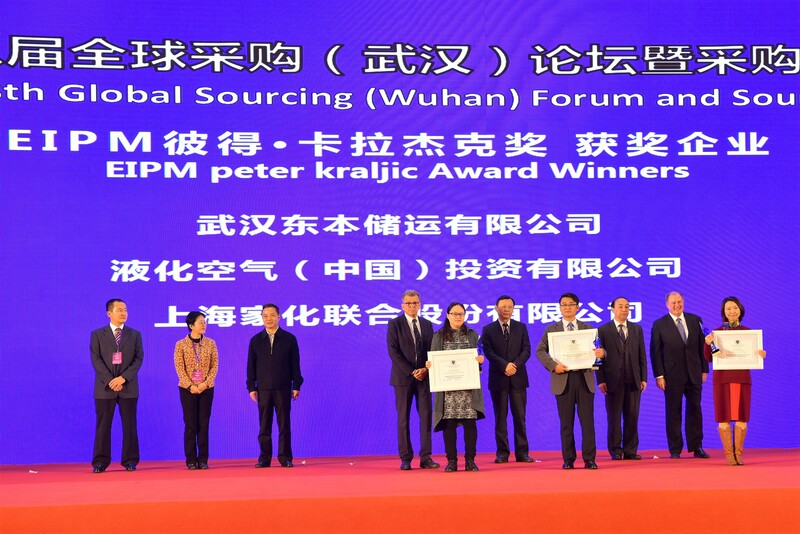 The 1st edition of the EIPM-Peter Kraljic Awards in China was celebrated , the 14th of November 2017, in Wuhan during the renowned Global Procurement (Wuhan) Forum co-organized by the China Federation of Logistics & Purchasing (CFLP) and China Hubei Provincial Government. The EIPM-Peter Kraljic Awards recognise Purchasing organisations across the world for their outstanding practices and for modelling the way forward. The winners are elected by a jury chaired by Dr. Peter Kraljic and composed of industry leaders and purchasing experts at the outcome of a very detailed and fact-based process. Companies are evaluated using the EIPM Maturity Assessment Tool based on the EFQM Business Excellence Model, followed by on-site audits for the finalists. In this edition, recipients were recognised on the following categories: “Value Creation“, “Process Excellence”, as well as “Supplier Relationships”. Winners were announced by Mr Bernard Gracia, EIPM Dean and Director, and the Awards given by Mr. TONG Daochi – the Vice Governor of Hubei Province of China and Mr. HE Liming – the President of CFLP. Air Liquide China Procurement organisation is becoming a strategic organisation thanks to some excellent and distinctive features. Mission and Vision roadmaps are well shared with the rest of the organisations, mature category management and supplier management are in place as well as some dedicated Purchasing for Business Partners. Shanghai Jahwa United Co., Ltd. Purchasing Department has implemented a solid procurement process in which strategic suppliers play a key role. The focus is on growing and developing together, with specific ambitions and targets in a mutual approach where both parties see each other as partners. Wuhan Dong Hon Logistics Co has a very lean and high performing Procurement Organisation that delivers outstanding results to the business. The organisation has deployed robust processes that are tightly monitored and is collaborating with other departments in great openness and transparency.